So you have a lawsuit of some kind and it is not a personal injury claim. You can’t afford an attorney or you may be able to afford an attorney, but you really don’t want to spend the money to pursue your claim. If your claim involves an action for money of any kind, for example a breach of contract, foreclosure, for possession of some type of real estate, breach of fiduciary duty or other type of claim for money, an alternative fee arrangement may be the way to go. The age of hourly billing for attorneys is rapidly changing. Our firm handles matters using all types of alternative fee arrangements. When you chose your attorney to handle a breach of contract claim, you need to consider using these types of attorney billing methods to limit your exposure to excessive attorney’s fees. The hourly billing method involves the attorney billing by the hour for all work performed on the case. You receive a monthly bill with the time entries charged to your file for the month. This method works well in cases not involving a claim for money, or in cases where you are defending a claim brought against you by someone else. Alternatives to the hourly attorney billing method include a contingency fee, a suit fee plus contingency fee, a straight flat fee, a success fee plus reduced hourly, a reduced hourly rate plus contingency and a flat fee. The most common type of alternative fee used by attorneys is the contingent fee. A contingent fee involves the attorney getting paid a percentage of the recovery. This type of billing may be used to handle all types of commercial collections claims. A suit fee may be included in this type of claim. A suit fee is a fee earned by the attorney upon filing suit. For example, if the attorney sees your case as more complicated than a normal collections case, the suit fee will help get the case started. This suit fee can range from a few hundred dollars to thousands of dollars depending on the amount involved and the complexity of the case. In addition, a contingency fee may also be used in combination with a reduced hourly rate. For example if the attorneys rate is normally $350 per hour. This rate might be lowered to $250 per hour with a contingency of say 15% or 20% upon collection. A straight flat fee is often used for matters involving contract preparation and drafting. 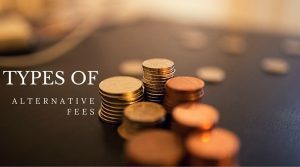 You need to have your attorney commit to the fee at the outset as much as possible to ensure you will not be charge more than you anticipate for a particular project. A success fee, is an additional fee received by the attorney upon a successful outcome. Often, this fee is included along with a slightly reduced hourly rate or a lower contingency rate. In the end this fee may be substantial, but of course, it is only paid if you win. Ultimately, it is up to you to ask your attorney about these billing alternatives. Feel free to call our firm any time to discuss billing alternatives to help you get your claim filed. Previous PostWhy Mediate in Florida State Court Proceedings?